Rev. Brigstocke is recorded as officiating at a baptism and celebrating a wedding in Bowning in 1839, and Rev. Rennis as conducting 2 worship services in 1863 before St James was built. The foundation stone was laid in 1878 by Susan Brigstocke, Rev. Charles’ widow, and the church dedicated by Archdeacon Pownall February 1879. In 1880 Cannon Faunce reports 15 services held at St James, and in 1881 fortnightly services were held, some conducted by a lay reader. For some years prior to 1977 services ceased to be held, and the church fell into disrepair. In 1989 Rev Norman Kelley was keen to revive country churches and parishioners set about fundraising and the considerable restoration & rearrangement. The organ is believed to have come from St Nicholas’ Jeir after its closure. 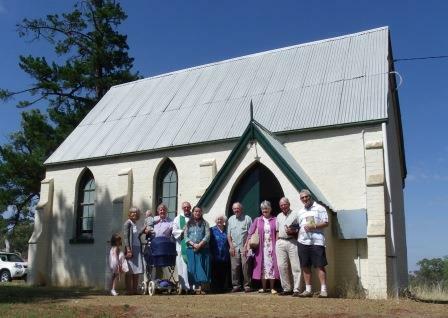 Replacement floorboards came from an old shearing shed, wall cracks repaired, and other work carried out to bring this lovely church back to life. It was rededicated on 3 November 1990 by Bishop Ian George. The church seats 50 people and services now held monthly lead either by clergy or lay ministers. Please prove you are human by selecting the Garbage Bin.